How Town is a Belgian-Latvian band led by bass player/composer Lennart Heyndels. Their music is not easily classified, jumping from the more experimental corner of improvisation to a spontaneity and flexibility clearly rooted in jazz, they bring well worked out compositions taking inspiration from a pop, folk and singer-songwriter tradition. Since its beginnings in 2012, the band has released three albums: How Town (2013), a suite based on the E.E. Cummings poem ‘Anyone lived in a pretty how town’, No marvel (that I mistake my view) (2014) and I dare you sea (2016). I want to watch a tree grow (2018) is How Town’s fourth album and definitely their most eclectic one. Consisting of compositions by all members of the band, the album has lyrics in four different languages (Russian, English, Latvian and French). 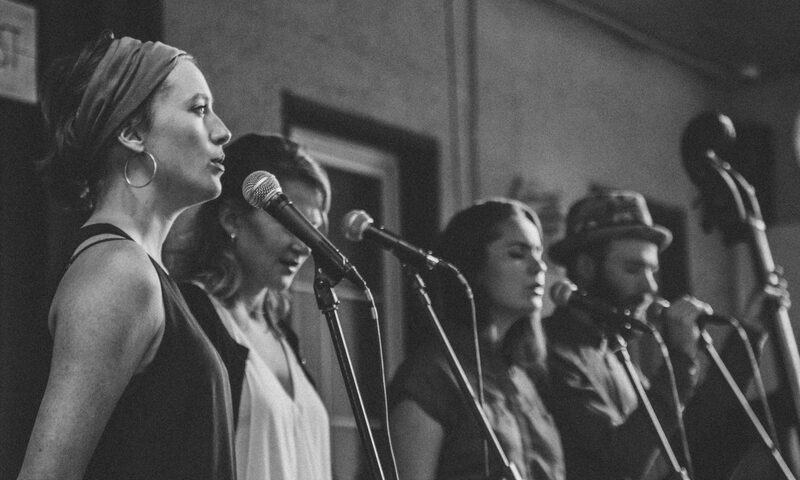 Choral harmonies meet twisted bass grooves and sharp guitar sounds, before unnoticeably transforming into folk songs you might as well be whistling on your bike. Before you know it you find yourself in the middle of a compelling ballad with the rhythmic pulse of a ping pong ball and you may ask yourself: “How did I get here?”. A question which will become more and more irrelevant as you join How Town in watching their tree grow. How Town has performed all over Europe including The Netherlands, France, Germany, Slovenia, Austria, Poland, Lithuania, Latvia and Belgium. They played at major festivals like Jazz International Rotterdam, Match & Fuse London and Theater Aan Zee and at concert venues like Bimhuis, Porgy & Bess and Stadtgarten. The band has won several prizes among which the Keep An Eye ‘The Records’ award (2017) and the Jong Muziek prize at Theater Aan Zee (2014).